Miller Replica 2" Shallow Type Casing For Headlamp Fitting. Scale Reading 8-0-8 Black and White Dial with Chrome Bezel. Diameter: 2" Scale Reading: 8-0-8. Shallow type. 2" Diameter. Black dial with Chrome bezel. Reading 12-0-12. Fits early 6v British machines. 12amp. Made in England. Diameter: 2' Scale Reading: 12-0-12. 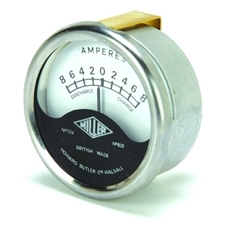 Ammeter 1-3/4" Diameter. Black dial with Chrome bezel. Reading 12-0-12. 12amp. Made in England. Diameter: 1.3/4' Scale Reading: 12-0-12. Miller replica No75V,No832. 2" Diameter. Black and White dial with Chrome Bezel. As fitted originally on various models from about 1947-62. Made in England. Diameter: 2" Scale Reading: 8-0-8. 2" Diameter. White dial with chrome bezel. Reading 12-0-12. 12amp. Made in England. Diameter: 2' Scale Reading: 12-0-12. 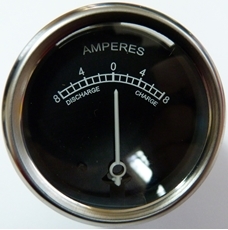 Ammeter 1-3/4" Diameter. White dial with Chrome bezel. Reading 8-0-8. 8amp. Made in England. Diameter: 1.3/4' Scale Reading: 8-0-8. N5C, 14mm Fitment includes : BSA C15, Triumph T140. L82C, 14mm Fitment includes : BSA D1 (1954-),D3,D5,D7,M33, Triumph T100/T110 (Cast Iron), SV models, T20 Tiger Cub.